Peter Conant is a Principal at Vocon, a top 40 design firm with offices in Cleveland and New York. Here, he shares lessons about the essential role that architects and designers play in branding spaces for clients. Expressing an organization’s brand in the reception area helps employees, clients, and potential new hires understand a company’s brand as soon as they arrive, setting the tone for their experience in the space. Photo by Jim Maguire, courtesy of Vocon. A brand stems from what a company believes and the principles that guide its actions. Branding a space must be done thoughtfully. Carefully making use of every design element can help reinforce a company’s culture with existing and potential employees, attract fresh talent, and demonstrate the embodiment of the corporate philosophy to its constituency. For example, our work with the New York Blood Center was an opportunity to use a physical workplace to illuminate the discoveries and developments in blood science that are so central to the Center’s mission. Architects and designers play an essential role in helping organizations maximize their brand expression opportunity in their physical facilities. In our sensory overload society, it is more important than ever to develop a consistent and clear expression of what an organization values and represents. Architects and designers play an essential role in helping organizations maximize their brand expression opportunity in their physical facilities. When determining how to brand the physical workplace, the first discussion between the organization and the design team needs to center on understanding the principles by which that organization works and lives. These principles will be used to guide how team members, clients and visitors experience the space and create the springboard for all aspects of design. 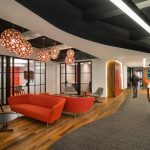 The entrance area for the New York Blood Center includes details on the discoveries and developments in blood science the center has helped make possible, bringing their brand’s commitment to innovation to life. Photo by Tom Sibley, courtesy of Vocon. Carefully making use of every design element can help reinforce a company’s culture with existing and potential employees, attract fresh talent, and demonstrate the embodiment of the corporate philosophy to its constituency. 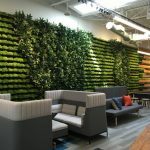 For instance, when a company’s brand embraces an optimal workplace for all associates, its space will include equal access to daylight, amenities, and environmental benefits for all employees, illustrating the organization’s commitment to its staff. For companies committed to knowledge sharing, or those with multiple offices, communication and collaboration tools such as mobile work tools and communication devices should be available to everyone at any time. Visually, a clear framework of messaging, graphics and brand expression should be developed and used in a similar fashion throughout the space. The brand should be expressed consistently from the front doors to the break room, creating a cohesive feel throughout the space. Here, this branded break room keeps company culture and values top of mind for employees. Photo by Jim Maguire, courtesy of Vocon. A brand should be expressed everywhere from an organization’s front door to the break room, showcasing it consistently to employees, clients and potential new hires. Reflecting the brand throughout the space across many interaction points demonstrates a unifying cohesiveness and commitment to the brand’s values. It is a powerful method of communicating a company’s deeply held philosophy. Every space should tell a story, and the design team has a unique opportunity to mold the user experience in three dimensions. Successful environments are created when you are able to align a brand’s touch points with a matching quality of space. Balancing permanence and flexibility in brand expression is key as we create spaces that are meant to last for many years. When mapping a brand identity to a physical space, we must determine the unchangeable pieces, such as those aspects reflecting core principles, as opposed to the adaptable components, such as graphic elements or wall finishes. This careful balance enables the brand to remain fresh and relevant throughout its life. * Statistics found in the “Impact of Office Design on Business Performance” by the British Council for Offices.